Edgwater, Pleasant Valley, Ridgefield, Fairview. 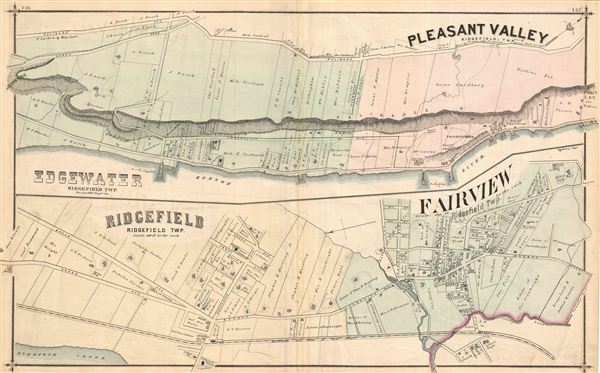 Maps of Edgewater merging into Pleasant Valley, and Ridgefield merging into Fairview, showing roads, hachured relief, property boundaries and owners' names. Published as plates 156-157 in Walker & Pease' exquisite 'topographical, illustrated, historical, descriptive' Atlas of Bergen County, New Jersey, 1876. Two exquisite lithographic views of two area residences with ladies and gentleman, sailboats, peacocks and dogs appear on verso, one repaired with conservators tape. Good. Even overall toning. Backed on archival tissue for stability. Original centerfold exhibits some wear. Edge wear mostly confined to margins. One large repaired tear extending well into page.